Home / Modern Pest Blog / Dead Flies Everywhere! Does this picture remind you of an all too familiar sight this winter and early spring? These are cluster flies, and they’re making a mess in thousands of homes right now. 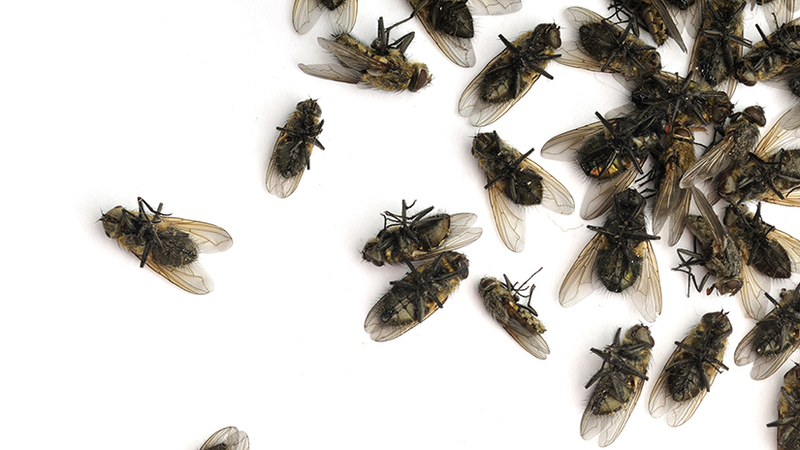 They’re a distasteful sight, but there’s no shame in finding these dead flies littering your floors and window sills. In fact, if you live in a rural area, it’s common to see them this time of year. And you’ll continue to see them until summer. Cluster flies are a nuisance pest because they die all over peoples’ homes in the spring, but it’s the fall when the problem actually begins. Those dead flies strewn across your floors have been living in your house all winter long, and now they’re trying to get out. Got Cluster Flies? Call a knowledgeable licensed professional at 1-800-323-PEST or contact us to request a FREE Quote, ask us a question or Schedule a Service! I’ll explain what you can do to prevent this in a moment, but first, it’s important to know a little about them. Cluster flies are not like the usual houseflies you see buzzing around rotting food and animal excrement. They feed on flower nectar and like to sunbathe outdoors. So, the silver lining around a cluster fly problem is that you don’t have to worry about them laying eggs in your food or making you sick. They’re more common near vast stretches of land like fields. The reason for this is really fascinating: cluster fly larvae are parasitic to earthworms! You will never see cluster fly larvae squirming in your trash cans because the adults lay their eggs in earthworm burrows. The larvae then infest and feed on the worms, and when they pupate into adults, they emerge from the ground like the zombies in Night of the Living Dead – but for worms. There are plenty of pests that love your warm home as much as you – lady bugs, ants, stink bugs, and hornets. Cluster flies are one of them. Cluster flies are attracted to warmth. On sunny summer days, you may see them on the southern side of your house to soak up some rays. As it cools down in the fall, these flies seek the warmth of your home and will squeeze through tiny holes in your eaves and siding and around your chimney and pipes. Once inside, cluster flies hibernate the winter away. They “cluster” together in corners of attics or in wall voids to stay warm. On warm days in the winter and spring, they wake up and try to get out. But instead of going outside, which is usually still very cold, they buzz around until they die, leaving you with a mess. I’m afraid there is no sure way to keep cluster flies out on your own. You can seal up every little hole, but that would be a long and potentially pointless project. An interior treatment will cut down on the messes you’ll have to clean as the days get warmer. This will also, unfortunately, result in lots of vacuuming of the dead flies. 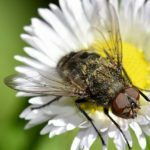 The best way to prevent a cluster fly mess in the spring, is to have the outside of your house treated in the fall – around mid-September to mid-October. An exterior treatment will also help out with other bugs that like your warm home, such as ladybugs and stinging insects. Every season brings a new threat from pests. Be prepared. Modern Pest Services offers a HomeCare Green Program for year-round pest protection, as well as Wildlife, Termite, Mosquito, Tick, and Bed Bug Control Services. Call 1-888-997-3312 or contact us for a FREE Quote.